Hugo and Nora, a pair of very large hippopotamuses, were so big that they always seemed to cause a commotion wherever they went. The other animals in the jungle were quite distressed by the two hippos. Saddened by the troubles caused by their size, the pair sought help from Sala, the wisest old ape in the jungle. Hugo and Nora asked Sala what they could do to be smaller. Sala offered wise counsel to the two, and upon taking his advice, for the first time they could remember, they actually felt small. But soon after, they were once again troubled by their enormous size. That is until one day, when they came to realize how very special they were simply because of their size. 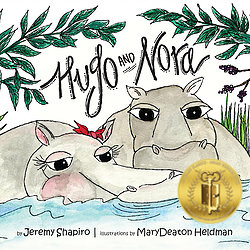 Author Jeremy Shapiro’s Hugo and Nora is a delightful and engaging picture book that children will love to read again and again. Illustrations by MaryDeaton Heldman are perfectly paired with this lovely tale which is truly inspired. This heartwarming book will hold as much appeal to kiddos as it will for adults, and is ideal for bedtime stories and classroom readings. Recommended for home and school libraries, this book has earned the Literary Classics Seal of Approval.